Wes Memorial Fund Donations for the month of December 2007! A gift donation has been made by Roger Groth, on behalf of Richard and Ruth Groth. A generous donation made by Bonnie Vozar. A kind donation made by Lynn & Ben Ranallo: "Merry Christmas from Alex and Padme' Ranallo!" A kind donation made by Wendy Schild, with a matching donation made by her company GE. Kind donations made by Denise Kerr throughout the entire year of 2007. We thank you for your kindness and support. We want to send a special 'Thank You' to Anne and Roger for their extremely generous support throughout this year, that has been matched by a donation from HSBC. We cannot express how much we appreciate all you've done. Anne Davis with her newest foster boy, little Gilligan. Donation made in memory of Mocha, the beloved chocolate lab girl of Barb and Ralph Scalise, by the Foreign Language, Social Studies and ELL Division of Elk Grove High School in Illinois. We want to thank the staff at Elk Grove High School for their kind donation and are sending heartfelt condolences to Barb and Ralph for their loss. 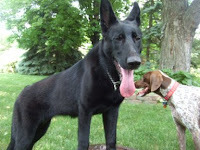 Suzanne Albright and William Bozek have also made a donation in memory of Mocha. We want to thank them for their kind support. 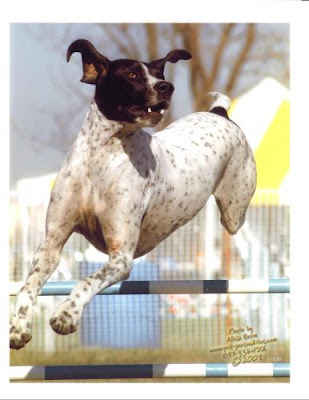 We want to send a big thank you to Sherry Neiderhiser for the donation of a one of her watercolor paintings of an English Setter to Illinois Birddog rescue. Your kindness will never be forgotten. Wes Memorial Fund Donations for the month of October 2007! We want to thank all families for their generous donations. We couldn't do our work without your help. We hope we haven't forgotten anybody. Thank you all so very much for your support! Wes Memorial Fund Donations for the month of August 2007! 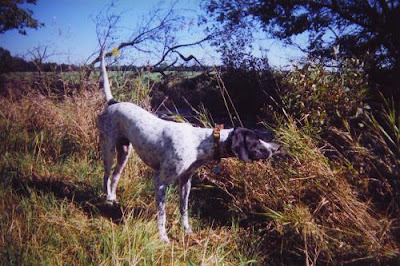 We were so touched by the extremely generous donation received by Dr. Carl, who's been treating IBR pointers and setters for a very long time. We are touched by her dedication and compassion for the rescue cause. Thank you! A big "thank you" to all the wonderful people that have contributed to Duke's knee surgery. This boys knee went out constantly, not a good thing for a sweet, active, young setter boy like Duke. After he heals up he will be able to chase around like the young puppy boy that he still is. Wes Memorial Fund Donations for the month of July 2007! Extremely generous donation made by Jodi Johnson, accompanied by the following note to Lisa Spakowski: "I just wanted to send a little support your way. I've seen how good you are to my 'kids' and know you are doing the same for the dogs you save. Keep up the good work." Generous Donation made by Larry Nelson. We thank you greatly for your support. Wes Memorial Fund Donations for the month of June 2007! 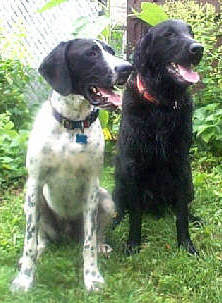 Donation made by Gary Berg: "From Silo Molly and Jack!!!" We thank you very warmly for your kind donations. They are greatly appreciated. Her official name is Luna, thanks to you. It seems to fit her. Melissa, I just can't thank you enough for bringing her into my home. And I'm sure she feels the same way. She's adjusting really well. Every hour, there is more puppy coming out. She's also figured out how to climb into the various planters, bring mulch into the house and crumble it all over the living room, eat dirt, etc. She loves my grandkids - they're coming for the day tomorrow. I left her in the crate today for about an hour. She seemed to do fine. We need Ceres to come and play! I made a contribution to IBR. Thank you again, you wonderful person. The IBR family wants to express their deepest sympathy to Anna (a friend and dog-sitting client of Lisa's) for her loss of Lucas. Anna writes: "A day has not gone by that I've not cried for him. I miss him so; he was such good company. 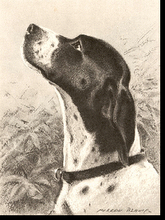 I have enclosed a donation to Illinois Birddog Rescue in his memory." We are thanking Anna for her kind and generous donation. 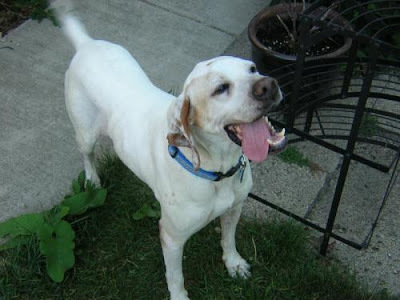 Support for Mattie---find a forever home soon---buddy! Donation made by Sarah Brashear: "For Mattie"
In memory of Rita Martin! Your contributions are greatly appreciated. We want to express our deepest sympathy to the Martin family for their loss. Wes Memorial Fund Donations for the month of May 2007! "To be used for Candice/Sadie's medical expenses, or as needed." Donation made by Debby Filler and family "for the Wes Memorial Fund"
We are thanking you all from the bottom of our hearts for your generous support, which has never been more needed than at this time. We will never forget your kindness. Wes Memorial Fund Donations for the month of April 2007! "Every bit helps. The work you do is important. 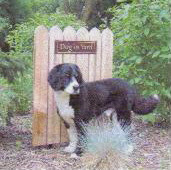 There's nothing quite like a 'Pointer'." We want to thank everybody for their generous donations. They are much needed and greatly appreciated. 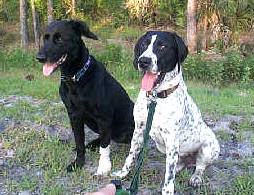 Three badly maimed pointer/setter mixes Hope, Strength & Courage were patiently nursed back to health by their shelter. 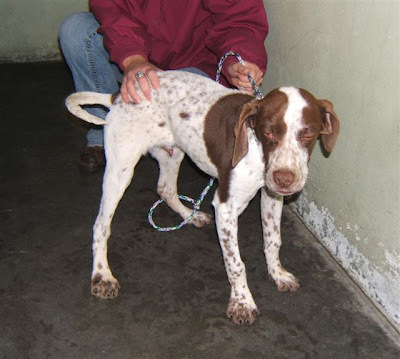 Illinois Birddog Rescue is taking them under their wing, as their time was running out. 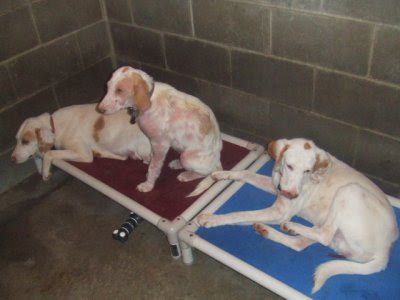 Continuing vet care will be necessary for these three, especially for Hope, who is still struggling with skin issues. An extremely generous donation was made by Mr. Kaufman. You are a true rescue angel and this sweet trio and Illinois Birddog Rescue thank you so much for your contribution. Little Dorothy was sitting at a Michigan shelter with not much hope at rescue, as she’s an older gal with wounds from frostbite and a huge tumor. 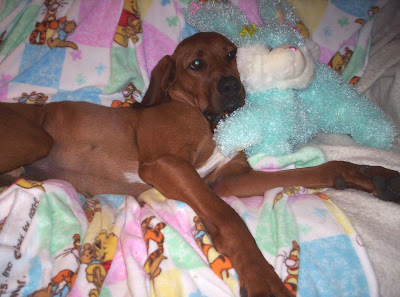 IBR thought she should have something to look forward to and vet tests show hope that surgery could actually give her a brighter future and hope a forever home. Sadly Dorothy did not survive your surgery. IBR cremated her and gave her ashes to foster mom Lisa Floros in memory of her loving care of sweet Dorothy. A heartfelt "Thank You" to Mike and Jeri McClure who made an extremely generous donation that covered Dorothy's surgery cost. "I am so very sorry about Dorothy. Words really don't help in situations like this. Later on they will. Please let everyone know a candle will be lit for Dorothy and hugs are in the wind to all." We thank all of you from the bottom of our hearts for your support. Her school was able to raise $174.04 for the puppies!! Kathy is coming over to meet them on Saturday- so we’ll get some pictures for her to take back to the school! 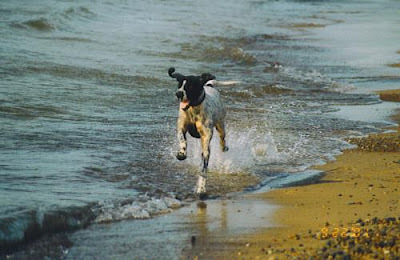 Illinois Birddog Rescue, Inc is making a difference in our community. I think Kathy just found us by a random search on petfinder and she saw our plea for help. Thanks a heap- Kathy! Kathy was also personally thanked by three of the buck funds puppies (Gidget, Jersey Girl and Wheaties) who gave her sloppy puppy kisses. feelings that went through me when I looked at those shots. I am so happy those babies have a shot at a wonderful life.